Verizon’s (s vz) early success with the iPhone 4 (s aapl) could very well be something to write home about, according to recent findings shared with us by app analytics firm Localytics. The company discovered that of all traffic through its clients’ applications on iPhone 4 devices in July, 32 percent came from Verizon. Verizon also reportedly got off to a very good start with a nearly 20-percent share in the first week. Localytics is represented on around 70 million iPhone handsets worldwide, with clients like News Corp.(s nws), Skype (s msft) and Turner (s twx) (which makes titles like Robot Unicorn Attack and Adult Swim, among others), so it’s drawing from a fairly large pool to come up with these numbers. It seems surprising that Verizon should have such a big slice of the iPhone 4 pie, since AT&T had an eight-month head start on Verizon with the device. But perhaps it was to be expected, since so many were so dissatisfied with AT&T’s service for so long. And, since Apple waited before releasing a new iPhone, many more iPhone owners would’ve seen their contracts expire than is usual during Apple’s upgrade cycle. Freed of commitment and without any new hardware in the immediate future, many might have seen an iPhone 4 on Verizon as a good opportunity to jump ship. If Verizon can attract switchers even with a significant timing disadvantage, we can expect it to fare even better should the iPhone 5 comes out on both networks at the same time, which will happen according to Verizon’s own CFO. Another possibility is that customers are rushing to secure Verizon iPhones in an effort to lock in grandfathered unlimited data plans. 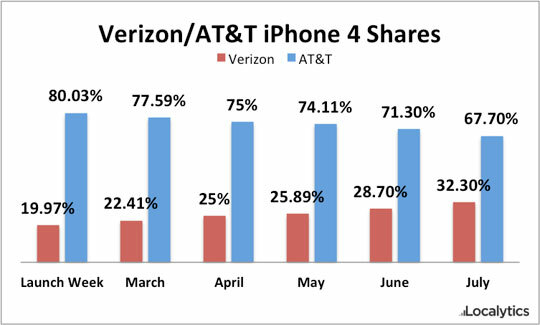 Localytics notes that Verizon’s iPhone 4 share has jumped quite a bit in June and July, up 2.8 and 3.6 percentage points vs. the previous month, respectively. Verizon was first reported to be planning to end unlimited data soon back in March, though the company had discussed the possibility even last year. The end of unlimited plans was confirmed in June. The new usage-based pricing model for smartphone data took effect Thursday, July 7. What are the actual sales numbers? Specifically, is the number of iPhones being sold greater than before the Verizon launch, and if so, by how much? Without this information, the % of market share is an incomplete view.